Wow. I mean, realistically, what else can you say? I have tested or owned over two dozen computer speakers over the last decade. Some, such as Monsoon MM1000 and the Altec Lansing VS4121 Versatile Speakers have sounded great. Others, not so much. So it was with some trepidation that I opened and plugged in the new FX6021 Altec Lansing speakers for review. I had just finished a review of the MX5021 speakers, also from Altec Lansing, which I gave a 4.5 out of 5 rating. I was unsure if I were really in the mood to review yet another pair of speakers, much less a pair from the same company I just reviewed for. But the life of a reviewer never ends, and we don’t always get to review what we would prefer. The FX6021’s sport a large subwoofer and two very tall desktop speakers. Half as wide as the above-mentioned MX5021’s, the FX6021 satellite speakers are much taller, and sports six 1” drivers in each enclosure. The satellites also have a removable base, which simply slide on and off. This way, you can also mount the speakers on your wall to free-up desk space. The subwoofer contains a single 6.5” throw speaker, and is quite heavy. All the controls from your computer run first to the sub, and then out to the satellites and control box. Controlling the speakers is an attractive control box with an infrared pickup for the included remote control, an infinity knob for volume, treble, and base control, and a power on/off switch. While the control box feels less than sturdy, and the knob a little feeble and cheap, it works very well. The three hundred dollars, I would have hoped for a metal, possibly aluminum, and control box made of sturdier stuff. The control box also has a nice slot for storing the small remote control. If you have a G5, PowerBook, or a newer iBook, the silvery FX6021’s will look quite nice sitting on your desk. While the color match is not perfect, they do match up quite nicely. While the base of the satellites is indeed metal, the speaker case is simply painted plastic. But those are about the only negatives I could find with the Altec Lansing FX6021 2.1 Speaker System, and they are minor and almost inconsequential at that. The real test in speaker reviewing is somewhat subjective, how these puppies sound! Back to my opening statement. WOW! With 75 Watts RMS, the FX6021’s have solved that problem. When the wife is away, I can crank out the AC/DC, Tesla, Van Halen, Beatles, or Tool to my hearts content, REALLY ticking off my neighbors. Actually, I had the tunes cranked up really loud one day while working on my porch when my next-door neighbor mentioned how good the music sounded. (Evanescence that day, for those curious.) When I showed him where the sound was coming from, he was simply amazed that such small speakers (albeit largish for typical computer speakers) could produce such clarity at such a volume. While still not as powerful or clear as my home entertainment system, the FX6021’s are fantastic. I am not usually one swayed by what a PR department writes on any product. A PR department could write something flattering about retail cat feces if they needed to. But in this case, they really did hit the mark on describing the power and near-perfect audio reproduction the FX6021 deliver. I am very, very impressed with these speakers. For years, I have used the Monsoon MM1000 as my benchmark for sound quality in computer speakers. Until now, none have quite equaled them. 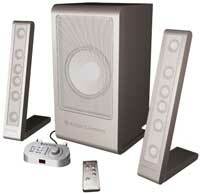 My benchmark speakers have now changed, and the Altec Lansing FX6021 2.1 speaker system now holds that honor. Loud, crisp, and loyal to the source material, you will love the FX6021’s. MyMac.com Rating: 5 out of 5. The perfect speakers for their price!